For the Australian soap opera actor, see Bobby Morley. Robert Adolph Wilton Morley, CBE (26 May 1908 – 3 June 1992) was an English actor who was usually cast as a pompous English gentleman representing the Establishment, often in supporting roles. In Movie Encyclopedia, film critic Leonard Maltin describes Morley as "recognisable by his ungainly bulk, bushy eyebrows, thick lips and double chin, [...] particularly effective when cast as a pompous windbag." More politely, Ephraim Katz in his International Film Encyclopaedia describes Morley as "a rotund, triple-chinned, delightful character player of the British and American stage and screen." In his autobiography, Responsible Gentleman, Morley said his stage career started with managements valuing his appearance for playing "substantial gentleman" roles — as a doctor, lawyer, accountant or other professional member of society. Morley was born in Semley, Wiltshire, England, the son of Gertrude Emily (née Fass) and Robert Wilton Morley, a Major in the British Army. His mother came from a German family that had emigrated to South Africa. Morley attended Wellington College, Berkshire, which he hated, followed by RADA. As he was a famous "Old Wellingtonian", generations of headmasters tried to contact him, without success, with Morley stating "the only reason for me visiting Wellington would be to burn it down". Morley made his West End stage debut in 1929 in Treasure Island at the Strand Theatre and his Broadway debut in 1938 in the title role of Oscar Wilde at the Fulton Theatre. Although soon won over to the big screen, Morley remained both a busy West End star and successful author, as well as appearing in touring productions. A versatile actor, especially in his younger years, he played Louis XVI in Marie Antoinette (1938), for which he received an Academy Award Nomination as Best Supporting Actor. As a playwright he co-wrote several plays for the stage. His 1937 play Goodness, How Sad was turned into a Ealing Studios film Return to Yesterday (1940) directed by Robert Stevenson. Later, he had outstanding success in London and New York with Edward, My Son, a gripping family drama written in 1947 in collaboration with Noel Langley. Morley played the central role of Arnold Holt, but in the disappointing film version Spencer Tracy was miscast, turning Holt, an unscrupulous English businessman, into a blustering Canadian expatriate. Edward, My Son (1949) was directed by George Cukor for MGM-British. His acting career continued with roles as a missionary in The African Queen (1951), The Story of Gilbert and Sullivan (1953), as W. S. Gilbert, and in Oscar Wilde (1960). Baby boomers will remember with macabre fondness, Morley's 1959 performance in an Alfred Hitchcock Presents adaptation of a Stanley Ellin short story entitled, 'Specialty of the House'. 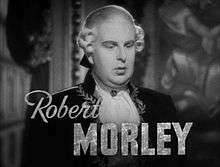 Morley also personified the conservative Englishman in many comedy and caper films. He was the face of BOAC (later British Airways) as the merry television commercial spokesman of the 1970s with "We'll take good care of you" for British Airways. Later in his career, he received critical acclaim and numerous accolades for his performance in Who Is Killing the Great Chefs of Europe?. During the 1980s, Morley hosted a celebrity cooking show on Cable TV, Celebrity Chefs. He also hosted (providing explanatory introductions) the Granada Television series (1980-81) Ladykillers. He was renowned as a witty raconteur and for being an eloquent conversationalist. Morley was honoured by being the first King of Moomba appointed by the Melbourne Moomba festival committee and, in typical humility, he accepted the crown in bare feet. Morley was in Australia touring his one-man show, The Sound of Morley. In his book British Film Character Actors, Terence Pettigrew wrote: "Morley, who has more wobbly chins than a Shanghai drinking club, enjoys poking fun at life's absurdities, among whom he generously includes himself." He was the subject of This Is Your Life in 1974 when he was surprised by Eamonn Andrews. Robert Morley married Joan Buckmaster (1910–2005), a daughter of Dame Gladys Cooper. Their elder son, Sheridan Morley, became a writer and critic. They also had a daughter, Annabel, and another son, Wilton. Morley was appointed a Commander of the Order of the British Empire (CBE) in 1957 and was also offered a knighthood in 1975 but declined. Morley died in Reading, Berkshire, from a stroke, aged 84. ↑ Larger than life: the biography of Robert Morley - Margaret Morley - Google Books. Books.google.com. Retrieved 2012-06-12. 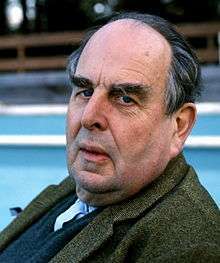 Wikimedia Commons has media related to Robert Morley.